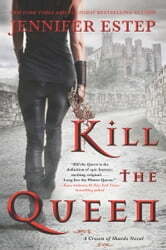 The first step in the making of a fierce queen..
Fast paced and action-packed. I love Jennifer Estep's books cos it also comes with a hero with heart and characters that develop as you progress. Awesome read! With a strong female character and an action packed storyline, this is one book i could not put down! Captivating, romantic! I like to be in a world of magic. This was a fantastic story! As soon as I saw this book online, I knew that I wanted to read it. Since this book is the beginning of a brand new series, I was really excited to give it a try. I did have a bit of a slow start with this book but that had everything to do with me and nothing to do with the book because the book was great. Once I had some time to dedicate to reading, I ended up devouring the bulk of this book in a single day. This was a story that grabbed me and didn't want to let go. Lady Everleigh's life is about to change. She lives in the royal court and is actually seventeenth in line for the throne but she is treated rather poorly. She is often the token royal sent to do the things that more important royals don't want to do like bake pies or learn complicated dances. Things go horribly wrong at an event at the palace and soon Everleigh is more focused on survival than anything else. I try to go into books as blindly as possible and I don't think I even read the entire summary for this book before I got started with it. I do recommend going into this one blindly because I think that the book's summary gives a whole lot away. I was completely shocked by some of the turns this book took which I think added to my enjoyment. I thought that Everleigh was a fantastic character. I loved how much growth we saw in her over the course of the story. She starts out knowing her place in the world and just trying to do what was expected of her to the best of her ability. She proves to be quite resourceful and has a lot of strength she didn't know she had. Even at her toughest, she never stopped thinking about others and was willing to make huge sacrifices in order to protect those she cared about. This book had a lot going for it. There are some pretty intense action scenes that really kept the excitement level high. I thought that the world building was very well done and loved all of the different ways that magic could manifest in an individual. I thought that the relationships between the characters were very well done and felt quite authentic. I liked that there is just a hint of romance worked into the story. I would highly recommend this book to fans of fantasy or urban fiction. I thought that this book was a fantastic story filled with a lot of action and characters that I grew to care about. I can't wait to read more from this wonderful series! I received a digital review copy of this book from Harper Voyager via Edelweiss.